Lack of access to risk-appropriate care, or the right level of care at the right time, has proven dangerous for women and infants in the United States (U.S.) and around the world. A Wall Street Journal analysis of CDC data from 2015 showed that women in rural areas die of pregnancy-related complications at a 64% higher rate than those in large U.S. cities, whereas women fared better in rural hospitals in 2000. Only half of rural counties have an obstetric provider available, creating what the Wall Street Journal calls “maternity deserts,” in which women often have to travel for hours to receive antenatal care and give birth. 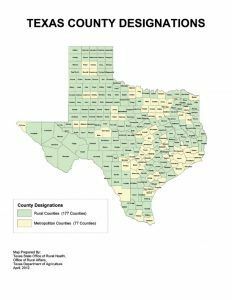 The state of Texas, in the south-central region of the U.S., is the second largest state in the country at 268,820 square miles, with 177 of its 254 counties designated as rural. Regionalization of care, which is a system for the delivery of health care within a region to ensure accessibility of essential services—even for patients in remote and rural settings—has been in place for decades to designate where infants are born or transferred according to the level of care needed at birth. Recognizing that the concept of perinatal regionalization of care for both the woman and the newborn had shifted over time to focus almost entirely on the newborn, the American College of Obstetricians and Gynecologists (ACOG) and Society for Maternal Fetal Medicine published an Obstetric Care Consensus document on Levels of Maternal Care in 2015 to formalize facility standards for maternal care. In Texas specifically, any facility that provides maternity care and wishes to remain eligible for Medicaid reimbursement must receive a level of care designation by the Texas Department of State Health Services by 1 September 2020. As part of the designation process, the Texas Department of State Health Services requires a site survey to assess compliance with the Texas Administrative Code. ACOG has opened an office in Texas and will provide survey services for Levels II, III and IV hospitals that provide maternity care. On 1 May ACOG held its first formal surveyor training in Austin, Texas. A 2013 Texas House bill added neonatal and maternal care designations to the Health and Safety Code, which was amended in 2015 to mandate the creation of initial rules for the designation by 1 March 2018. The task force behind the effort, the Perinatal Advisory Council, is chaired by Dr. Eugene Toy, an obstetrician-gynecologist at University of Texas Health Science Center, who believes that these designations and the regionalization of care have increased collaboration among facilities in the state. According to Dr. Christopher Zahn, ACOG’s Vice President of Practice Activities, the verification program operates under the philosophy of “getting women to deliver at the right place at the right time.” Zahn says that a hospital’s level is not a ranking or a rating but rather a categorization for use in collaborating and coordinating regionally. “This is a concept that’s still early in its implementation, but the goal is to improve outcomes and health through regionalization of care,” said Zahn. Approximately 90 surveyors, which included about half physicians and half nurses/certified nurse-midwives from all over the state, attended the training, according to Arlene Remick, ACOG’s Program Director in Obstetric Practice. Program updates and more information can be found here.